I eat a ton of beans several times a week, every week. What can I say? I just love them. They can be incorporated into so many different great recipes, and flavored in so many different ways on their own. There are several different kinds of beans and I've rarely tasted a bean that I didn't like. I was given the opportunity to review Cooking With Beans by Rhiana Jones. It was sent to me as an e-book that could be read on my Kindle or smartphone. Very convenient, in my opinion. I just downloaded it onto my kindle app on my phone and was able to look over all of the recipes in the cookbook. I was sitting at home, grabbed my phone and looked over the cook book. First thing that I noticed was that all the recipes are fairly simple to make and a lot of the ingredients needed for practically all of the recipes are things that I usually keep in my kitchen. I loved that! The book is not very long. I kind of wish it was a little longer but the recipes that are included all sound pretty good. Now, there are a couple of recipes inside that include red meat, pork, sausage, and lamb and since I don't eat those sorts of things, I would probably just substitute the meat with a vegan meat alternative, like I usually do with a lot of other recipes. No big deal, really. There are recipes for breakfast, lunch, dinner, and desserts as well! Yes, you can make a few desserts with beans in them! Did you know that? Have you ever tried to do this? I wanted to include some pictures of one of the recipes that I tried. It is a dessert and I made it for my family for our Christmas Eve dinner. I made a Gluten-Free Garbanzo Bean Chocolate Cake! Sound weird? I thought it sounded very interesting. I love trying out Gluten-free alternatives s so I was dying to try this one out. The recipe called for semi-sweet chocolate chips. I had a little less than what was needed so I used milk chocolate chips for whatever was missing. I melted them in a pot on the stove, although the recipe said to do it in the microwave. I don't have a very powerful micro, nor did I have enough patience to wait until the chips were completely melted in there. I just did it on the stove and got things moving along quicker. I blended the eggs, baking powder, drained/rinsed garbanzo beans, white sugar, and vanilla extract in the blender. Then after the melted chocolate had cooled, I added the chocolate as well and blended some more. 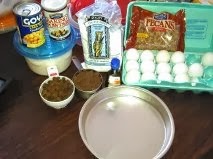 Then I poured in some pecans (the recipe called for walnuts that I didn't have. Pecans sounded just as good to me). Stirred them with a fork and poured the chocolatey pecan mix into a greased baking pan. It called for a circle pan, but mine was too tiny so I ended up using a rectangular one. I poured it all in and popped into the oven for 35 minutes. I checked it, it still needed a little more time, so I cooked it for about 8 more minutes before it was finally done. When I pulled it out, I honestly was a little nervous because not only did it come out a little lopsided, it also looked super dry. I sprinkled on the final touch--confectioner's sugar. Now it just resembled a huge brownie. I let it sit for over an hour and when I came back it had completely evened out and looked a tiny bit more moist. I was happy about that. 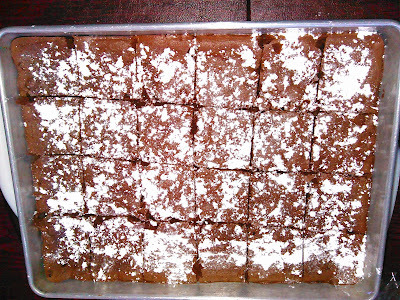 Since I used the rectangular pan and the cake had come out fairly thin, I cut it into squares, very much like brownies. I couldn't resist- I had to try one. They tasted a lot more like very moist, extremely chocolate packed brownies with nuts, instead of cake. I'm not complaining at all. I love brownies, so this was great :) They were a total hit with my family too. No one could even tell there were garbanzo beans in them. Only one person said the "cake" was a bit too chocolatey, but I saw her sneaking a few bites when she thought no one was looking. Haha. They were a lot better than I expected. I wouldn't mind making them again. If you can get your hands on the cookbook, this recipe is a must try! So, are several of the other recipes. It's super simple to download to your smartphone, kindle, computer, e-reader, or android device. The ingredients are all very common-in fact, you might already have them in your house. Very easy recipes to make. If you love beans, then of course I think you'll enjoy trying these recipes out. Beans are great for you!